We are pleased to announce a new release of the DeskPRO helpdesk platform, build #323. We are pleased to announce a new release of the DeskPRO helpdesk platform, build #320. For a while, DeskPRO's logic for the Unassigned tickets listed below was to included tickets that were not assigned to a specific agent. Whether a ticket was assigned to a team or not, had no affect on whether the ticket was listed as Unassigned. As per 20th March 2014, this functionality has changed. An unassigned ticket is a ticket that is neither assigned to an Agent or an Agent Team. We believe this change helps those companies that use the team structure extensively. Tickets can be assigned to an agent, a team, both or to nothing. Only "nothing" would now make the ticket unassigned. If you want to be able to find tickets that are assigned to a team, but not an agent you can create a custom filter. We have produced a PDF Quick Start Guide which is automatically emailed to new agents when their account is created. It's a 12-page guide aimed at helping new agents learn to use the DeskPRO interface and understand the range of features available. It also includes a glossary of DeskPRO terminology. We will be working to improve the guide and keep it up to date to reflect changes in DeskPRO. We'd welcome your feedback. We are pleased to announce a new release of the DeskPRO helpdesk platform, build #318. CHANGE Ticket preview tooltip hides when moving away from the subject line. Makes it faster to quickly move the mouse cursor down a ticket list without having the tips stick around. We are pleased to announce a new release of the DeskPRO helpdesk platform, build #317. 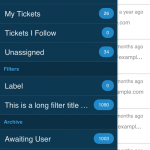 In DeskPRO #317, a lot of work has gone in to making the ticket list faster and smoother. The list now responds to changes faster and more accurately. Tickets are added and removed from filter results in near real-time. No more distracting loading screens. As new tickets are added or updated in real-time, their position within the list is kept accurate. For example, if you are sorting by urgency and the ticket urgency changes, the position of the ticket in the list will change as well. While working with mass actions, DeskPRO enters a “limited” real-time update mode. Ticket properties are kept up- to-date in the list and tickets are automatically removed, but no new tickets are added. This means the list you are working on stays the same so long as you have mass actions open. It makes it easier to work with mass actions on busy helpdesks where other agents may be interacting with tickets at the same time as you are trying to perform mass actions. We are pleased to announce a new release of the DeskPRO helpdesk platform, build #316. FIX Reduce superfluous log lines in ticket logging. 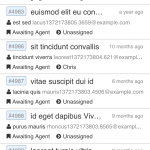 For helpdesks with many agents and/or filters, the logging could increase the processing time for messages and increase storage space needed to store logs. FIX Errors creating new tickets with attachments. Blobs must be read outside of the main transaction because flush()'ing from blob storage fires off the ticket post-save events prematurely. We are pleased to announce a new release of the DeskPRO helpdesk platform, build #314. IMPROVEMENT Multiple-page ticket list in user interface was a bit confusing with the grouping between open/resolved. Now, if you move past page 1, you see a normal list of tickets. IMPROVEMENT Specifying user when using the #user action code will now create users who don't yet exist rather than silently ignoring the action code. FIX Glossary words were being highlighted within any string rather than only full words. For example, a glossary word 'em' would match within the word 'theme'. We are pleased to announce a new release of the DeskPRO helpdesk platform, build #313. FIX SLAs on first response time were not marked as completed for tickets created by an agent. Now, as long as the ticket is marked as awaiting user, first response SLAs are satisfied (i.e., the agents message is considered "first response"). FIX Fix a plaintext cut pattern for "XYZ wrote:"
FIX Email gateway code detector runs agent access code checks before public access codes. This solved an uncommon case where agent replies might be processed in user context mode. We are pleased to announce a new release of the DeskPRO helpdesk platform, build #311. FIX Missing 'undelete' button from deleted publish content. To undelete you would need to toggle the status select. FIX Notification preferences for 'alert' (browser notifications) were being treated as 'email' for system filters in some cases. For example, this could cause an email notification to happen even through you only wanted a browser notification. FIX Inconsistent UI when editing publish category permissions. When 'Everyone' is checked, all other usergroups need to show checked as well. FIX Sticky search words on articles, downloads, news and feedback would cause items to always appear in search results even if a user did not have permission to view them (e.g., no permission to view category or the item was hidden/deleted). 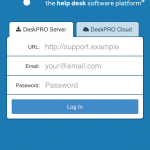 We are pleased to announce a new release of the DeskPRO helpdesk platform, build #309. We are pleased to announce a new release of the DeskPRO helpdesk platform, build #308. We are pleased to announce a new release of the DeskPRO helpdesk platform, build #307. FIX Fix not saving messages that failed to decode into UTF-8. The message would be blank and so it would not be saved, but triggers would run as if it were. FIX Missing permission checks on specific "modify" sub-permissions when applying certain macro actions (e.g., checking the "modify > change fields" permission when changing workflows). We are pleased to announce a new release of the DeskPRO helpdesk platform, build #306. We are pleased to announce a new release of the DeskPRO helpdesk platform, build #304. CHANGE Increase size of ref field in the database to better handle longer custom ticket ref formats (was 25, now 100). FIX Fix treating all robot messages (e.g., those who advertise themselves as being Auto-Submitted) from being run through the standard bounce-detection handling. This could result in an email message with the same subject as a previous ticket being silently saved as a reply rather than a new ticket. This kind of scenario can be common with automated alerts. FIX Fallback mechanism for handling custom ticket ref format collisions. Will just fallback to a random ref and accept the ticket. FIX Workaround bug in swiftmailer issue #258: Attachment email attachments (type message/rfc822) would not work properly. They would usually show up in email clients as 0-byte "email.eml" attachments. We are pleased to announce a new release of the DeskPRO helpdesk platform, build #303. FIX Possible JS error could cause ticket tabs to break sometimes during load. Reloading would fix the problem. We are pleased to announce a new release of the DeskPRO helpdesk platform, build #302. FIX Fix crashes in Google Chrome ("sad tabs"). This was caused by a memory garbage collection bug in Chrome itself that required a workaround. We are pleased to announce a new release of the DeskPRO helpdesk platform, build #301. We are pleased to announce a new release of the DeskPRO helpdesk platform, build #300. We are pleased to announce a new release of the DeskPRO helpdesk platform, build #298. CHANGE DeskPRO now respects php.ini display_errors directive. You can override the server value by editing the appropriate line in config.php. FIX Missing "name" field on new feedback form would cause form validation error that would prevent the form from saving, making guests unable to submit feedback without first registering. We are pleased to announce a new release of the DeskPRO helpdesk platform, build #297. FIX Weirdness with saving smtp account during installer. You would sometimes need to refresh the page before saving the account worked. FIX When a ticket has missing required fields and you changed the department, the option would look like it changed but the department change did not actually save. FIX When switching departments, the required fields would not update in the UI, you would need to close/reopen the ticket to see the new required fields. We are pleased to announce a new release of the DeskPRO helpdesk platform, build #296. We are pleased to announce a new release of the DeskPRO helpdesk platform, build #295. FIX v3 importer did not insert own transports for each gateway account so every account would use the same default transport which could cause confusion later if triggers etc are used. FIX Changes made to a new ticket by a trigger would not be visible in the notification email template (e.g., the variable for department title would not be the department set with a trigger). We are pleased to announce a new release of the DeskPRO helpdesk platform, build #294. CHANGE Show the "Charge" option on the [Note] tab as well when "Show billing on reply form" is enabled. FIX Logging a 'rejection' for agent forwarded tickets where the forward was an email attachment. The email would process successfully, but the rejection still logged. FIX Fix run-order of conflicting trigger actions within the same trigger. E.g., "remove all slas" removing an SLA that was added with "add sla"
We are pleased to announce a new release of the DeskPRO helpdesk platform, build #293. We are pleased to announce a new release of the DeskPRO helpdesk platform, build #292. CHANGE The "reply" and "note" tabs in the agent interface now use separate input boxes to prevent mistakes (e.g., accidentally entering notes into the reply box or replies into the note box). FIX Scroll offset being off in some cases where the browser moves the scroll position. This created cases where you would need to scroll to the bottom of a view before being able to scroll up. FIX Bug in LDAP email address matching could result in an incoming email from an unknown user being attached to an existing user of the same username that exists in the LDAP directory. Affects helpdesks that use the default DeskPRO usersource in addition to an LDAP usersource. We are pleased to announce a new release of the DeskPRO helpdesk platform, build #291. We are pleased to announce a new release of the DeskPRO helpdesk platform, build #290. We are pleased to announce a new release of the DeskPRO helpdesk platform, build #288. We are pleased to announce a new release of the DeskPRO helpdesk platform, build #287. FIX Prevent over-cutting in new tickets on DeskPRO emails (e.g., if a user forwarded a feedback notification email, it would be cut down to a blank message). We are pleased to announce a new release of the DeskPRO helpdesk platform, build #285. We are pleased to announce a new release of the DeskPRO helpdesk platform, build #283. NEW New permission for viewing chat transcripts so agents without chatting permission can still view ended chats (e.g., linked from profiles or tickets). NEW You can now enable user KB subscriptions. Users are notified via email when new articles are published in their subscribed categories or when any of their subscribed articles are updated. IMPROVEMENT Bounced messages now check email attachments (common with bounce notices) for ref codes so the bounce notice can be attached to the proper ticket. We are pleased to announce a new release of the DeskPRO helpdesk platform, build #282. We are pleased to announce a new release of the DeskPRO helpdesk platform, build #281. IMPROVEMENT Full custom field info on objects returned via the api (e.g., along with the "rendered" text value, the custom field info like ID are returned as well).